This box typically contains 7-8 varieties of organic vegetables, 2-3 varieties of organic fruit, 2-3 packs of organically reared meat and 6 organic eggs. Our organic grocery box is a great way to get a wide variety of organic produce. 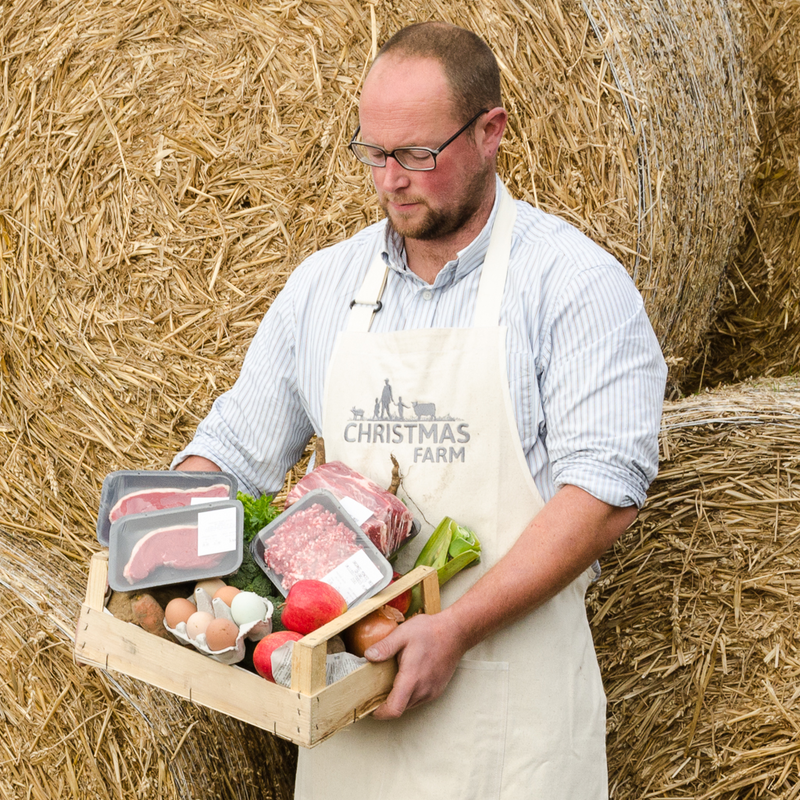 Being the same as our fruit and veg box but including some of our fantastic home produced meat. This box typically contains 7-8 varieties of organic vegetables, 2-3 varieties of organic fruit, 2-3 packs of organically reared meat and 6 organic eggs. We include a range of seasonal vegetables and fruit in the box, where possible these come from our farm but we cannot produce enough variety and quantity to fill boxes every week throughout the year so buy in extra fruit and vegetables mainly in winter and early spring to top up farm produce. We buy as local as possible and try to prioritise local or U.K. Produce. So we only ever buy English apples unlike some large box schemes who still source from abroad even though the same produce is available in the U.K. Although we cannot tailor boxes entirely to your liking, if you don’t eat a certain type of meat, vegetable or fruit just let us know and we can replace those items for you. We can also replace eggs if you have your own hens, etc. Perfect for families or couples who love to cook. Delivered free of charge. This box is also great for those who are looking for high quality meat as they undertake Atkins, paleo, clean eating or no carb diets. We can also includes bones for stock or bone broth free of charge, just ask for some when you place the order.